Lugging multiple expensive lens filters around in your camera bag will risk your investment - knocking and scratching one another inside small camera bag compartments. Putting all filters separately into different casings (that comes free with the filter) will just make your camera bag looks messy and hard to retrieve all your filters. 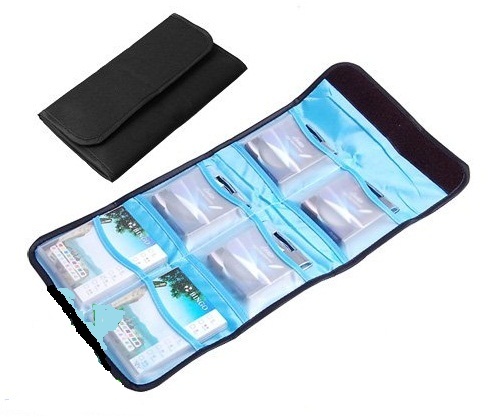 This 6 slots filter case comes into rescue, it enables you to organize all your CPL, ND, IR, Close Up, Star Burst Filter etc in 1 filter case for protection and easy retrieval. * * Type of Closure : Velcro. * * Design : Compact tri-fold design, purse-style pouch. * * Accommodates : 6 lens filters, up to 82mm thread sizes. * * Conveniently store and protect your not-in-use filters. Easy to carry, great for field work. * * Provides the ultimate storage solution and protection for your filters. * * Made of high quality nylon. * * Soft and durable material. * * Compact and very lightweight. * * Easy to carry and waterproof. * * Shockproof foam material inside. * * Soft, padded design protects your filters from occasional bumps and scratches. * * Each filter pocket is made from anti-static material to help keep your filters clean and ready for use. * * Handy for organizing your filters. When folded it becomes a compact, wallet sized case that can easily fits into your front pocket or any camera bag! * * Hold up to 6 filters, up to 82mm filter size. * * Fits all types of filters, both round or square filters. (e.g. Neutral Density (ND), Infra Red (IR), Ultra Violet (UV), Circular Polarizer (CPL), Star Burst filters).